Do You Have an Entrepreneur’s Bucket List? You Should! Ok, ok maybe that’s just MY personal bucket list…but do YOU have one for your business? But, let’s face it Ms. CEO, every entrepreneur starts with a dream and a burning desire to do more in their life – and in their business or company. Yet all too often, a few years down the line, many, if not most business owners have neglected to stoke those burning ambitions that were so fired up during the startup phase. Maybe it’s because they got too focused on just staying afloat, or maybe it became more about making money, and the “experiences” got pushed right off the map. Well, I want you to bring back the bucket list!! Collaborate with a bigwig (or two) in your field – here’s how I managed to cross that one off my list! Meet one of your business idols or mentors, in the flesh. Well, not THAT kind of flesh, but at least strive to meet them in person. Write YOUR story, in full and complete detail. Every. Damn. Word. BYOB – be your own boss, 100% on your own terms. Give to charity, or do something charitable through your business. Give back, pay it forward – however you want that to look and feel to you. Become a spokesperson and learn to own the room – or the stage! Travel for business – and get paid to do it. Grow your team – stop doing it ALL by yourself, just outsource and hire someone. Here are some tips for determining if you need a VA.
Got website shame? Ditch that shabby DIY’d website you pieced together (using blood, sweat, tears – so many tears) and trade up for the ultimate digital business card. Here are some recommended website & business building resources. Sell your business and start a new one… wait, what?! I was just getting THIS one off the ground!! You should use your entrepreneur’s bucket list to help you work towards success in your business – that’s a given. But, it can also help you keep a healthy mindset and overall outlook. The certainty that those big, juicy goals CAN be achieved, even if they seem a bit lofty at first. Be sure to list things that likely didn’t make the cut in your original business plan! The fun of this exercise and keeping a bucket list is that once you start asking yourself some hard questions like “What would my [mentor] do?”, then you would be surprised at what answers start to come up for you. When it feels like you’ve got some solid aspirations on your list — hang it up in your office, share it on socials, or verbalize it to a trusted friend or business bestie. 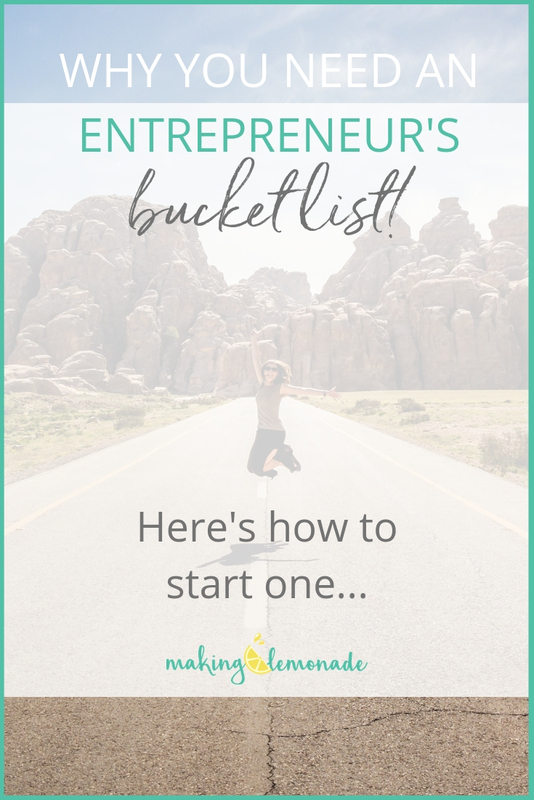 Want help crafting YOUR entrepreneur’s bucket list? WE’RE WAITING FOR YOU – RIGHT HERE!